After all those late nights studying, all that cramming for finals and all those last-minute papers, your hard work has finally paid off. You're ready to walk across that stage and officially graduate from college! On behalf of all of us at Subaru of Grand Blanc, we want to say congratulations. We know that it's no easy feat to graduate, and you should celebrate all of your accomplishments. You're finally done, and now you can move on to the next adventure in life. As our graduation gift to you, we make it easy to finance or lease a new Subaru at our Subaru dealership near Waterford, MI. Once you start your brand-new, post-college job, you're going to need a reliable way to get there every day. We can offer you competitive lease and finance specials to help you take on your next adventure. If you're a recent or soon-to-be college graduate, you can apply to lease or finance a new Subaru vehicle under our College Graduate Program. This gives you access to leases and loans approved through Subaru Motors Finance, which means you can get a very competitive rate. Plus, you'll be automatically qualified for any special lease or retail offers that are currently available. By choosing a Subaru for your first car, you're gaining access to a vehicle that offers outstanding value and reliability. Each new Subaru comes with standard Symmetrical All-Wheel Drive, which means you'll be able to easily face the road conditions wherever you're heading. Since buying or leasing a Subaru is a significant investment, it will also allow you to begin establishing credit in your own name. While you might not qualify for a car loan at some dealerships, we can help you get a rate that fits into your budget. Just make your monthly payments on time, and you can start building credit! What Should Recent Grads Know Before Financing or Leasing a Subaru? You can finance or lease any of our new Subaru models! Just talk to our sales team to pick out the right one for your lifestyle and budget. Those who graduated within the past 12 months or plan to graduate in the next six months from an accredited 2- or 4-year college, graduate school, nursing school or trade school are eligible for this special financing. We'll need to see proof of graduation, such as a copy of your diploma or a current transcript. We'll need to see proof of employment and your income. If you haven't started your new job yet, we'll just need a letter of commitment from your future employer with a start date within 90 days and a salary. 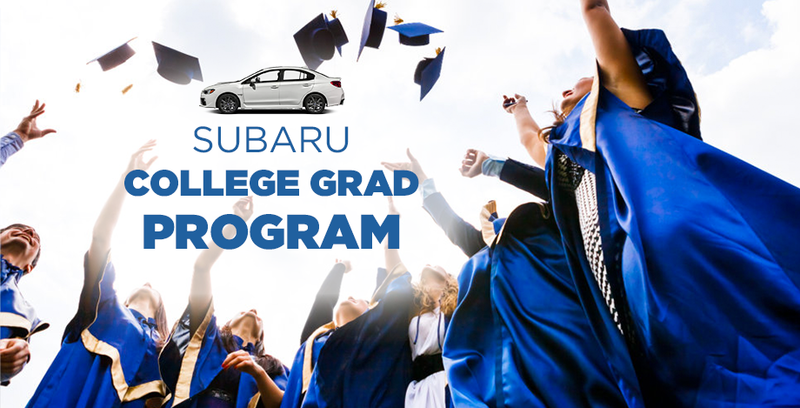 To learn more about the Subaru College Graduate Program, talk with the sales and financing teams at Subaru of Grand Blanc! We're eager to work with you.